Chinese Ambassador to Fiji Qian Bo (second from left), Prime Minister Voreqe Bainimarama (fourth from left), with Chinese Hospital Ship Ark Peace officers and Fijian Government official at the Office of the Prime Minister on August 3, 2018. Photo: DEPTFO News. Prime Minister Voreqe Baini­marama yesterday received a courtesy call from a delega­tion of the Chinese People’s Lib­eration Army (PLA) Navy Hospital Ship Ark Peace. Welcoming the delegation at his office in Suva, Mr Bainimarama acknowledged their visit and also thanked them for providing free medical services to the Fijian peo­ple. 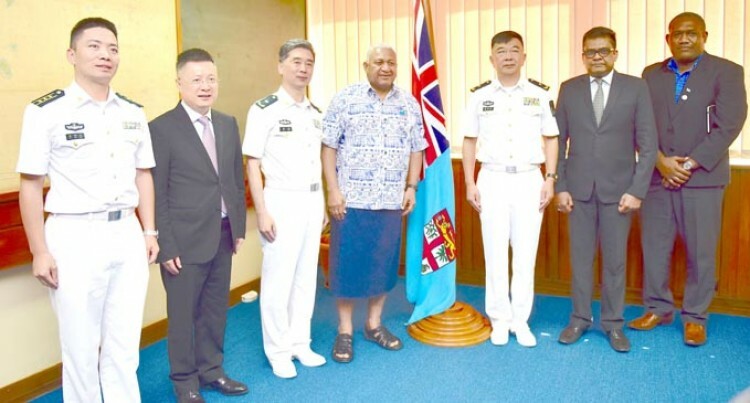 The Chinese delegation was led by Chinese Ambassodor to Fiji Qian Bo, Ark Peace’s task group commander Rear Admiral Guan Bailin, Rear Admiral Qin Wei and Captain Guo Baofeng. This is the Ark Peace’s second trip to Fiji to provide free medical ser­vices and registrations for entry into the wharf began yesterday and until August 8 at Ratu Sukuna Park in Suva. The ship is also scheduled to visit 13 other countries.